Trip stands on the court in Hinkle Fieldhouse. Photo courtesy of Butler Blue III’s Twitter page. 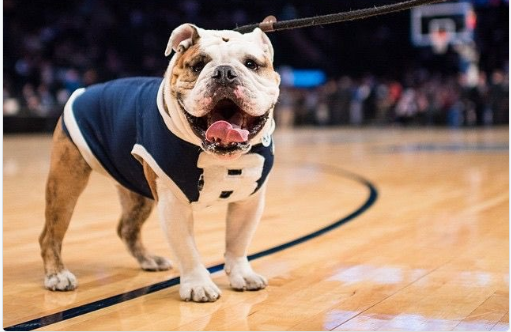 On Sept. 10, Trip, Butler University’s mascot, was verified on Twitter after having an account since 2011. Evan Krauss, marketing assistant of Trip’s owner, Michael Kaltenmark, said he remembers when the event occurred. He was at church on Sunday night playing foosball with second graders when his phone lit up with the notification. Krauss said working so closely with Kaltenmark and Trip on the social media side of the operation makes him check his phone any time it buzzes. So, when his phone lit up with that notification, Krauss was ecstatic. They had previously applied for Twitter verification three times. In order to be verified, the Twitter page has to have a header, profile picture, and a bio with a website or phone number. Krauss said this does not change much in the sense of how they will treat Trip now. “This will help in opening up doors for him,” Krauss said. He mentioned that with verification, people will take Trip’s Twitter page more seriously and may be able to get more attention and popularity as a result. In the last two months they have already gained 1,500 new followers on Twitter and expect that number to keep growing steadily in the next coming months, especially with this verification. His Twitter page boasts approximately 24,600 followers. On Dec. 23, Trip will be turning 5 years old and though he is young, he has done quite a lot in his career. Kaltenmark talked about how he got Trip when he was 7 weeks old. Trip learned from his mentor, Butler Blue II, by watching him and being around at events. Trip handles three different kinds of events almost daily. They can be characterized as student admission, community and athletic events. Krauss gave a rundown of Trip’s day last Saturday as an example of what he could handle in a day. From 8 a.m. to 9 a.m., Krauss took Trip to an admissions open house. Then at 11 a.m., they went to the Indianapolis Motor Speedway for pictures. Then, at 6:30 p.m., Trip made an appearance at the football game on campus. Kaltenmark explained that bulldogs are typically lethargic dogs. They like to sleep a lot and are very laidback. Trip appears to be a rare one because he loves to be out and about. Kaltenmark said even if he has had a full day of activities and appears tuckered out, if one asks him if he wants to go to a football game, he would immediately jump to attention. “This is basically all he knows,” Kaltenmark said. He has a different personality than Blue II and that is evident in just how enthusiastic he is to go out for any event possible. His personality is tangible in-person and also through his social media pages, especially Twitter. Perusing through Butler Blue III’s Twitter page, it is apparent there is a voice in all of the tweets. Examples of sassiness and confidence are strewn throughout this Twitter page, giving Trip a very tangible personality whether online or in person. Kaltenmark said that this social media program is so successful because of the voices and characters of each dog. Trip is, out of the three, the most enthusiastic and excitable. “Butler has a strong brand identity, and I love that he is the embodiment of that,” Kaltenmark said. Trip represents the university everywhere he goes. Krauss went on to say that Trip is also the voice of the university. Kaltenmark said Trip’s social media presence is so successful because he is readily available to the public. Students know Trip because Kaltenmark will walk him around the university and stop to let students take pictures and pet him. This public personality factor is very important to this program and even to school spirit. Anu Kadampelil, sophomore biomedical engineering and chemistry major, said that there is a correlation between Trip’s presence on campus and social media and school spirit here. “Having an actual dog as a mascot makes more people spirited about Butler and what it offers,” she said. First-year English major Carli Domingos had similar thoughts. If he is not walking around campus, he is hanging out in Robertson Room 200 with Kaltenmark and Krauss. Kaltenmark said that at least a dozen people come in every day to get pictures with Trip.